So...I saw this somewhere, but I don't remember where. If it's your site I saw it on, please let me know in the comments, so I can link to you. I believe it was a random post of facebook that I saw it on though. 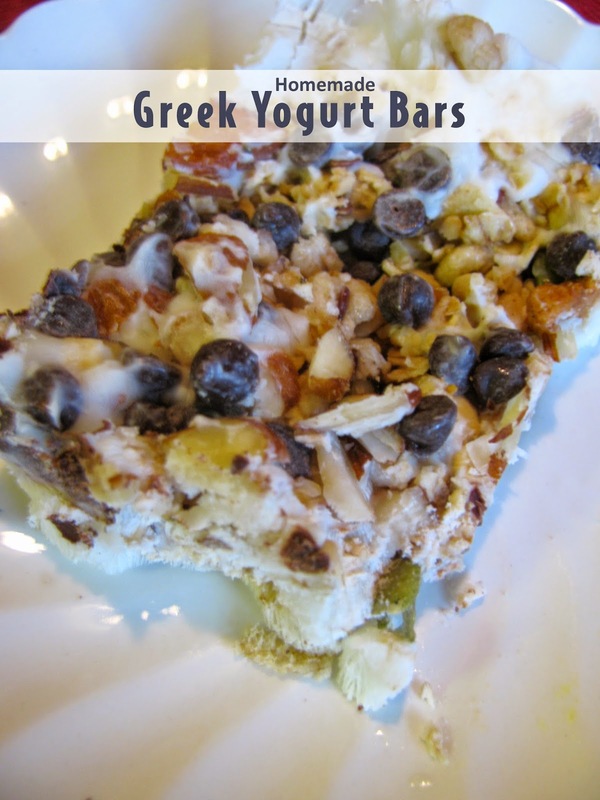 I made Homemade Greek Yogurt Bars! They are pretty good. Take a 9x9 glass, or metal pan, and spray it. Coat it with Greek Yogurt. We used plain, with a few drops of NuNaturals Orange Liquid Stevia. You could use flavored Greek Yogurt as well. I was just trying to use less sugar. The layer thickness is up to you. Ours was about 1/2 inch thick. I wanted it thick enough for the topping to stick to it. The toppings are up to you. Get creative! One bag of Made in Nature dried Cinnamon, Raisins, and Apples. Freeze the bars. Take them out about 10 minutes before serving them. They are really hard to cut right out of the freezer. They make a great after school snack. They are also great as an extra protein at breakfast time. Yum! These sound very good and healthy. I might have to try making these for my kids' lunches. Those sound awesome. I love how easy they are to make. Those look so good. Once I get home from Montana... I am going to have to try making these. These sound so tasty! I am really loving greek yogurt lately, so I need to try my hand at making a batch soon! Looks delicious! We'll have to make these today in our test kitchen! i can see how tasty it is...I've been looking for healthy snack for my kids and I guess this one will do...they love fruits.. I love that you made them yourself! they look delish!